After reading Ruth’s fantastic blog interview with Catherine. G. Gault. http://rhunt4.wordpress.com. 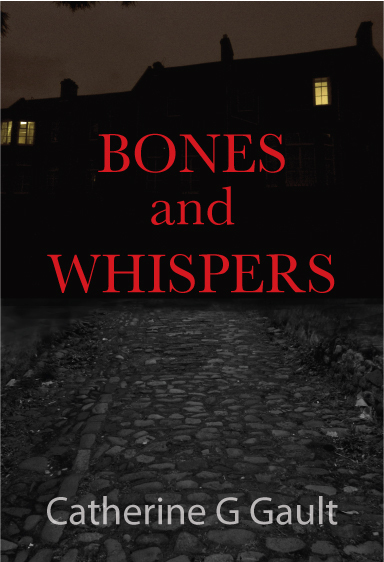 I brought Bones and Whispers By Catherine. G. Gault on the kindle. I think you can also get it in paperback too. It was a gripping read with a good few plot twists that kept me guessing until the end. The story itself was about murders that took place in sheltered housing facility in Edinburgh, where Jean lives. After the police has very little luck in finding the killer. Kate who is related to Jean takes it upon herself to look into the murders and try to uncover who the killer is, in-between doing her job as a social worker and trying to battle her own need for answers over what really happen in her family. The characters were interesting. I enjoyed reading about their lives and how they fit into the murders, as well as finding out who did the killings. I found it interesting that amidst the sheltered housing killings. Kate has her own secret that she is trying to figure out. It also left me by the end with enough questions to hope for second novel to be released in the future. I thought the Author did a fantastic job with this book, the characters were really interesting and really brought the story to life. I would recommend this book to anyone who loves a good mystery and likeable characters to put into question, before finding out who the killer really is. ← Jessie The Blog Dog! Choosing Book Friends Names. Great blog post, Katie, and thanks for putting the link up for my interview with the author. I agree is was a very absorbing story and the characters were very interesting. I also like the fact older characters were used. I agree it was a good read and the characters were interesting. Thanks for the great blog post. I’ve been planning to get this book for some time. It sounds like such an interesting read, with fascinating characters. I can’t wait to read it! I enjoyed Bones and Whispers too. It’s full of interesting characters and has a great plot. I particularly enjoyed finding out about Kate’s past, i think she’s a great amateur sleuth, and look forward to reading more stories with her on the case! Another great review, Katie! I will have to check this one out, too. I like the fact that the setting (sheltered housing) is unique, and it sounds like the characters are have their own complicated pasts and agendas, which always makes for a good read! It was a great book, and different being set in sheltered housing. I thought the characters were great, I like that too the idea of people being in one place all with different secrets and pasts.